December 24, 2013 February 10, 2016 ~ Sara W.
A while back, I was watching The Pirates! Band Of Misfits with my kiddos. 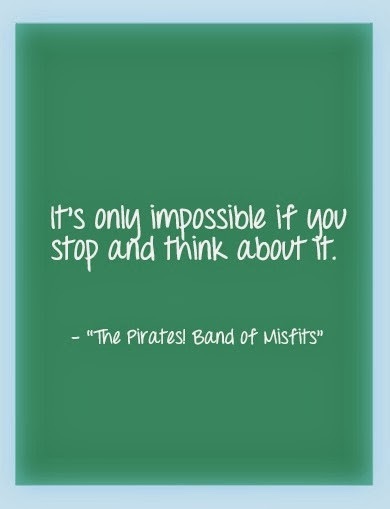 Towards the end of the movie, as things are looking bleak for the protagonist, The Pirate Captain, his response to the naysayers is, “It’s only impossible if you stop and think about it.” It’s such a quick line that I almost missed it. I found the line enlightening. Certainly, I am not suggesting we forego thinking things through, but I don’t imagine it does anyone any good to think things to death and risk lost possibilities. I did that very thing for years with writing. I came up with all the reasons why it would be pointless to even pursue writing. I believed it impossible that anyone would enjoy anything I had to write. I thought about it so much that I never did it. I’m learning that the action of writing in itself is fulfilling the desires of my heart. The perks of positive feedback is really more than I could have dreamed of for myself. But even on a smaller scale, as I sit here with no Christmas presents wrapped, my shopping incomplete, a grocery store trip still on the horizon, and bathrooms that need cleaning, I feel overwhelmed trying to process how it will all get done in time. The best thing I can do for myself and my family is just keep moving. Sitting here dwelling on what needs to get done will get me no further along. If a task is feeling daunting to you or a dream is feeling unattainable, may I suggest that the only thinking you do on the matter be to believe it possible and figure out the first step that needs to happen to make it so. My husband knows I can get easily overwhelmed by an over-flowing sink of dishes or a laundry list of to-do’s and he reminds me of the old adage, “How do you eat an elephant? One bite at a time.” So, pick up one toy, wash one load, write one post, decline one cookie, create one water color, put one foot in front of the other and make your goals and desires happen! Don’t let over thinking it stop you from achieving it! < Previous Remember to Look Up! Next > Bright New Year!